Throughout the ages, a great number of composers have contemplated the birth of Christ and have lent their voice to the awe that this miracle inspired in man. 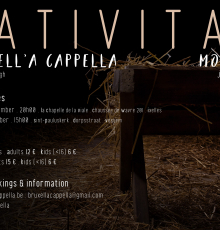 For its Christmas concerts on 15 and 16 December, Bruxell’A Cappella would like to give you a taste of the many musical interpretations of this theme from different traditions and eras. Under the expert direction of conductor and singer Michiel Haspeslagh, we will present a small selection of the many O Magnum Mysteriums that history of music has to offer, from the oldest polyphonic interpretation by Morales to the haunting contemporary version by American composer Morten Lauridsen. For this year’s Christmas concerts, Bruxell’A Cappella will be joining forces for a second time with male choir Molitva from Sint-Pieters-Leeuw, who will be presenting their Russian Orthodox repertoire.